In a Sri Lankan jungle, rival tribes of monkeys compete for prime real estate. Within each tribe, there is a defined social hierarchy. Those with higher status (whether they earned it or were born with it) are afforded shelter in storms and the ripest fruits, those with lower status often must venture into dangerous territory to eat, and have a harder time ensuring that they can provide safety and nutrition for their babies. 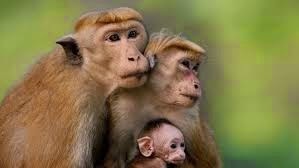 In this charming, fun DisneyNature film, we follow one low-born monkey, called Maya, as she becomes a mother and then works to ensure the survival of her son, Kip. Monkey Kingdom is not an adoption story – Kip is born to, and raised by Maya. Kip’s father, Kumar, is absent for much of the film, but does return. There are some elements to the story that might resonate with some young viewers – and some parents – who have experience with adoption. For one, the film strongly establishes that it’s harder to raise your children successfully if you’re in a lower caste. It seems likely that more children in foster care come from families of lower socioeconomic status than most foster families. Kip is separated from his father for much of the film. The tribe loses their home and becomes homeless for a while. Perhaps the one scene that seems most likely to trigger some adoption issues – for birth parents and for children who have been in foster care or who have been adopted – is when Kip is kidnapped from Maya by three higher-class monkeys who wish to punish Maya for breaking the society’s code. We see Maya looking for Kip, and Kip crying out for his mother. They do eventually reunite, but I could see this being hard for some viewers. The film credits Maya for allowing Kip to thrive. This could be very positive for children with a single mother, to give them a positive story of a single mom making things work. 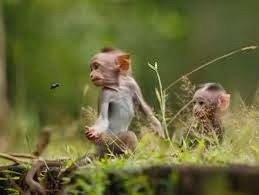 The film shows that people (well, monkeys) can thrive in spite of being born into poverty, and can sometimes even rise above it. 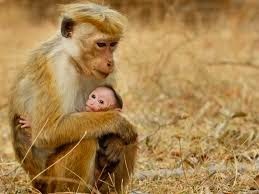 Maya is described as being “consumed by unconditional love” for her son. It’s always great for kids (and adults!) to grasp how much – and how unconditionally! – they are loved. After a long separation, Kip and Maya are reunited with Kumar. My wife, who describes herself as “probably a feminist” felt that the film was overly tilted towards Maya when it credited her for Kip’s success, while ignoring the legitimate contributions of Kip’s father. Kids who have been neglected or who have lived in severe poverty might find it difficult to hear the narrator describe the plight of the “last in line… By the time your turn comes, there’s [no food] left.” Food issues are relatively common for kids in foster care; many kids hoard in an attempt to ensure that they’ll have something to eat tomorrow, and one or two scenes in this film might touch on that – the narration just mentioned, and another scene or two where the monkeys steal food from humans. Kids who have been abused might cringe when they see high-status adult monkeys slapping Kip in the face when he acts out of line. There are some scenes of peril, and some monkeys die, but nothing gruesome is shown. In one scene, Maya is driven away from her son, and her son is carried away while Maya is brutally punished. Maya is separated from Kip for hours, and finally finds him, alone in the woods. 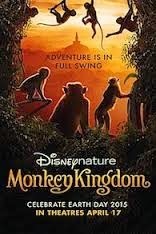 Disney does a great job of capturing candid scenes of life in the animal kingdom, which will delight many kids. Tina Fey’s comical but not over-the-top narration will engage adults. It is a fun film. There are some beautiful nature shots, and some moments that are fun enough to bring smiles and laughs. While there are some scenes that might come too close to being parallel with some painful experiences that might be familiar to kids who have been in foster care, many kids will like this one. It should be a good choice for kids ages 6 to 12, but parents with kids who have experienced abuse, neglect, or shortage of food, might want to watch the film first. Monkey Kingdom opens on April 17. What is a parent’s job? What made Maya a good mom? What is it like to have a dad who’s not around, and then do have the dad come back? Have you ever not had enough food? Do you ever worry that it will happen? What makes you feel less worried?